Note: David Trout, mentioned in this article, passed away in 2006. He is sorely missed. Tom Brown, 53, great-grandson of G. Loomis Gwinn (1861-1927) and Rosa Spade Gwinn (1873-1962), visited Round Bottom today for the very first time. Born too late, and busy for too long, I felt--as I do from time to time--that sense of having spent oneself on things and values not worth the cost. Rosa Gwinn moved away from Round Bottom in 1946 to live most of the rest of her days with her daughter, Leila, near Huntington, WV. Though I have memories of her, I was not born until three years later. And so I never had the opportunity to attend the reunions held there on the Sunday nearest Grandma Rosa's July birthday, where watermelon would be eaten and fought with, wonderful fun and food and fellowship were enjoyed among several generations--changing and growing with each passing year. And I never had my picture taken (as did nearly everyone who attended those reunions then, at one time or another) on the massive concrete steps leading up to the sweeping porch of the homeplace, built of rock and timber gathered and cut and finished from the resources of that very land. Those who were alive then and find themselves struggling with today's deflating economy must find conditions reminiscent of that postwar period. Three thousand dollars then was an enormous amount of money; yet that is what it would have taken for a child or grandchild, or a combination of many of them, to retain ownership of the G. L. Gwinn property only a few hundred yards upstream from the town of McKendree and across New River from the sturdy tracks of the C&O (now CSX) main line. But this year, my wife Donna and I visited Round Bottom. 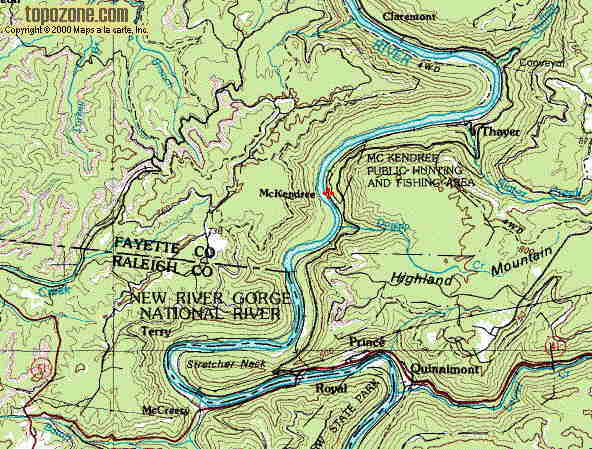 In a sense, it is now the property of all of us, since it is a part of the New River Gorge National River, a part of the National Park Service of the U.S. Department of the Interior. We got (and badly needed!) the help of our wonderful two cousin-couples: Cathy and David Trout of Christiansburg, VA; and Jennie and Mike Reilly of Riner, VA. Joining us was the Trout wolf, a Mr. Geronimo ("Mo"), who appears in a few of our photographs. As far as I know, nobody in the family had visited the property since July, 2000. Our main mission was to mow and trim the family cemetery, where Rosa Gwinn was buried in 1962. My major accomplishment was getting there--and back. We also took twelve minutes of HI-8 video and four 36-exposure rolls of 35mm color film. The Trouts spent two nights camping on the beach, and the Reillys one night nearby. The cemetery is in wonderful shape, thanks to all the hardy souls who have ventured to the property almost every summer in recent years. The barn, still standing only a few years ago, has now mostly collapsed. The house, still standing and intact enough to tour in 1984, is now rubble. Unfortunately, the advent of tourism as a major industry in the New River Gorge--along with the popularity of white-water rafting, which is probably the easiest way to reach the sandy beach below the Garden Ground high up on the mountain above, brought vandalism. Over the years, the windows and doors were stolen and removed. Weather soon deteriorated the load-bearing walls, and leaks developed around the chimney. Today, the kitchen stove lies where it has fallen, in the cellar. However, the sturdy foundation, the proud red-brick chimney, and the much-photographed and oft-used front steps all remain. Nature has overtaken most of the property, and it is now almost impossible to reach the river directly from the house. The chimney is the landmark that makes it possible to locate the house from the road (now just a wide path) behind it. Still intact is the carbide-gas generator behind the house which brought the wonders of automatic interior lighting to a home that had running water in the kitchen during the 1930's. Other pictures, including the cemetery. McKendree, West Virginia, of course, no longer exists. The store, the boarding house, the train station are gone; the casual observer would find absolutely no trace of them. A few hundred feet above, on the primitive road that ascends toward Stretcher's Neck and the towns of Prince and Thurmond, you can see only a set of overgrown concrete steps--all that remains of the McKendree Hospital and School for Nurses. At the cemetery, there is a palpable energy. It speaks of love and hard work and the joys of living well; of suffering and success and courage against all odds; but there is also an unmistakable aura of sadness because, now, there is no official resident in the place that was last called "home" by Rosa Spade Gwinn. Click here to return to the reunion home page.